a Yellow Warbler perched and singing in a big leaf maple. The Sunday bird walk went to Neck Point Park in Nanaimo. The morning was mostly sunny and warm. We spotted Harlequin Ducks, Double-crested Cormorants, Pelagic Cormorants, Pigeon Guillemots and Marbled Murrelets on the water. A Violet-green Swallow was perched high on a snag giving us great views. Orange-crowned Warbler, Black-throated Gray Warbler, Spotted Towhee, Song Sparrow, White-crowned Sparrow, Red-winged Blackbird, Brown-headed Cowbird,Song Sparrow, House Finch and American Goldfinch. Rutherford Road in north Nanaimo. A Barn Owl was seen along Michael Road in Cedar. it turned warm and sunny as the morning went on. We watched a family of Common Mergansers swimming very quickly along the river. Another family of Common Mergansers walked very quickly along the gravel bar. Six Great Blue Herons, two Turkey Vulture and two Bald Eagles flew above the mouth of the river. We saw three different Willow Flycatchers perched and singing on the top of bushes along the trail. There were four Yellow Warblers singing from bushes along the meadow, giving us great views. Fourteen birders saw and heard the following forty species of birds. Orange-crowned Warbler, Yellow Warbler, Western Tanager, Spotted Towhee, Song Sparrow, White-crowned Sparrow, Red-winged Blackbird, Brown-headed Cowbird,Purple Finch, House Finch and American Goldfinch. An Osprey was seen flying over the upper lake at Colliery Dam Park in Nanaimo. An Osprey was spotted perched on a stump near the upper lake at Colliery Dam Park in Nanaimo. Arrowsmith Naturalists Meeting, "Members Night: The Sequel"
The Tuesday Bird Walk on June 28, 2011 will be going to the Top Bridge Trail in Parksville. We will meet at the Parksville Beach, Community Park at the parking area in front of the Lions Playground at 9 A.M. or at the parking area along Industrial Way near Tuan Road at about 9:10 A.M. This will be the last Tuesday Bird walk for the summer. The bird walks will resume on September 6, 2011. Have a great summer! along Normarel Drive at about 9:20 A.M. 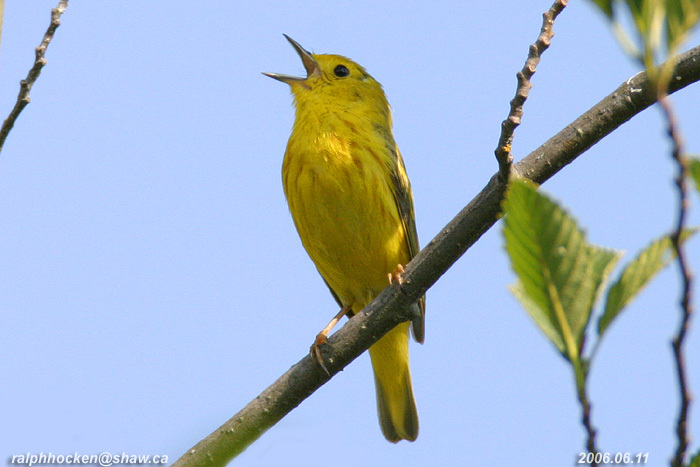 The Sunday Bird Walk on July 10 will be going to Buttertubs Marsh in Nanaimo. The Tuesday bird walk went to the Shelly Road side of the Englishman River Estuary in Parksville. The morning started out cloudy with a strong breeze but it turned warm and sunny as the morning went on. We watched a family of Common Mergansers swimming very quickly along the river. Another family of Common Mergansers walked very quickly along the gravel bar. Six Great Blue Herons, two Turkey Vulture and two Bald Eagles flew above the mouth of the river. We saw three different Willow Flycatchers perched and singing on the top of bushes along the trail. 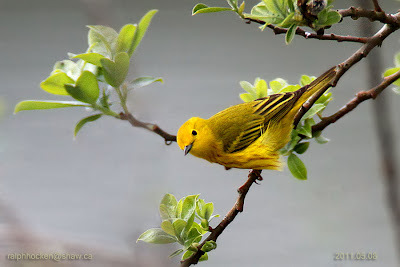 There were four Yellow Warblers singing from bushes along the meadow, giving us great views. The Sunday bird walk went to Linley Valley in Nanaimo. It was cloudy but the rain held off until the end of the walk. The morning air was again filled with the songs of birds. The highlights included seeing a Black-throated Gray Warbler perched and singing at the top of a tall Cedar tree. The rich robin-like song of a Black-headed Grosbeak resonated through the woods. We heard and saw a Western Tanager high up in a conifer tree. A flock of American Robins was spotted mobbing a Barred Owl near the ground in the forest. There was an Olive-sided Flycatcher and a Cassin's Vireo singing in the distance. A flock of Black Swifts flew high overhead. Thirteen birders, including visitors from Seattle and Great Britian saw and heard the following forty species of birds: Mallard, Bald Eagle, Barred Owl, Eurasian Collared Dove, Rufous Hummingbird, Downy Woodpecker, Northern Flicker, Pileated Woodpecker, Pacific-slope Flycatcher, Willow Flycatcher, Olive-sided Flycatcher, Warbling Vireo, Cassin's Vireo, California Quail, Common Raven, Northwestern Crow, Black Swift, Violet-green Swallow, Northern Rough-winged Swallow, Chestnut-backed Chickadee, Brown Creeper, Red-breasted Nuthatch, Bewick's Wren, Pacific Wren, Swainson's Thrush, American Robin, Cedar Waxwing, Orange-crowned Warbler, Black-throated Gray Warbler, Common Yellow-throat, Wilson's Warbler, Western Tanager, Spotted Towhee, Black-headed Grosbeak, Red-winged Blackbird, Brown-headed Cowbird, Song Sparrow, Purple Finch, Red Crossbills and American Goldfinch. 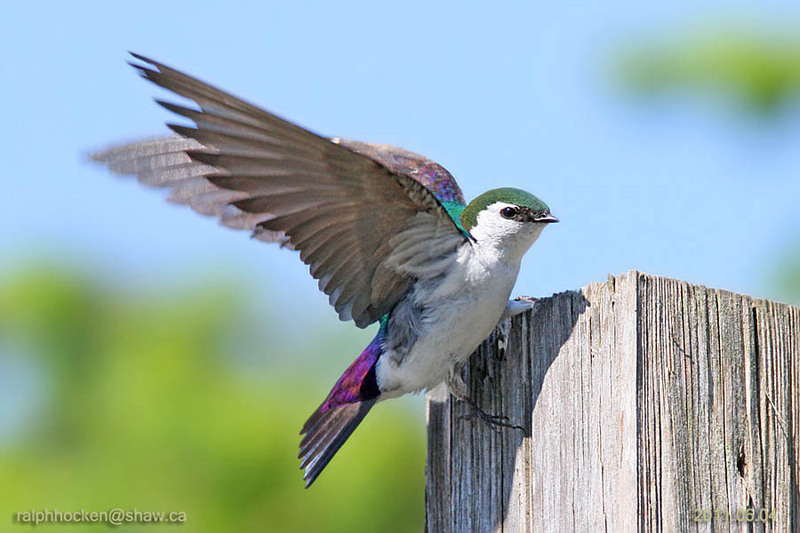 Purple Martins were seen flying over the Environmental Sciences Building at the Vancouver Island University in Nanaimo. 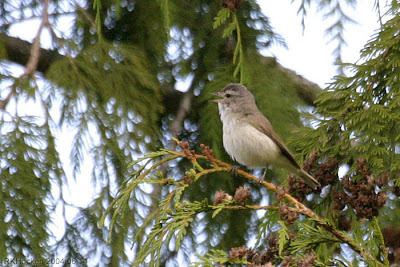 A Red-eyed Vireo was seen along the Top Bridge Trail in Parksville. The Tuesday bird walk went to the Beaver Ponds at Nanoose Bay. The morning was cloudy with a cool wind. We spotted Black Swifts flying high overhead. There were several male Rufous Hummingbirds doing their courting dives throughout the morning. A Willow Flycatcher was perched near the Beaver Ponds giving us great views. 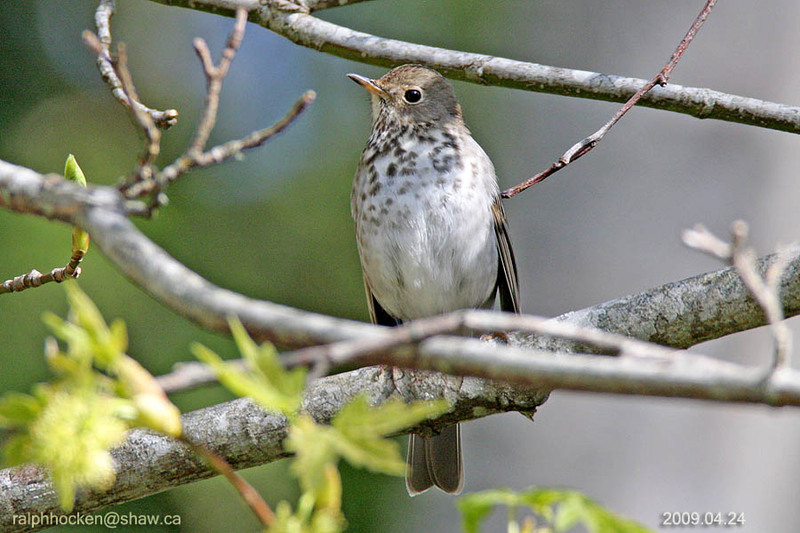 We heard Swainson's Thrush singing throughout the morning. Pacific-slope Flycatchers and a Cassin's Vireo were singing close by. We saw and heard the Black-headed Grosbeak high up in the top of a conifer tree. Northwestern Crow, Common Raven, Violet-green Swallow, Chestnut-backed Chickadee, Red-breasted Nuthatch, Pacific Wren, Swainson's Thrush, American Robin,Orange-crowned Warbler, Yellow-rumped Warbler, Black-throated Gray Warbler, Western Tanager, Spotted Towhee, Song Sparrow, Dark-eyed Junco, Black-headed Grosbeak, Purple Finch, Red Crossbill and Pine Siskin. Seventeen Caspian Terns and nine Spotted Sandpipers were seen at the Nanaimo River Estuary in south Nanaimo. A Red-breasted Sapsucker was spotted on an ornamental cherry tree in the Divers Lake area of Nanaimo. Two Caspian Terns were seen at the San Pariel side of Englishman River Estuary in Parksville. A Bullock’s Oriole was seen in a backyard in the 5200 block of Toms Turnabout in Nanaimo..
A Common Nighthawk was seen over Morrell Circle in Nanaimo. A Western Kingbird was seen and photographed at Jordan River on the west side of Vancouver Island. Evening Grosbeaks are visiting a backyard in the 2700 block of Neyland Road in Nanaimo. A pair of Evening Grosbeaks is visiting feeders daily at the end of Douglas Road in Nanaimo. Monday June 27, Springwood School, Parksville. The Tuesday Bird Walk on June 21, 2011 will be going to the Shelly Road side of the Englishman River Estuary in Parksville. We will meet at the Parksville Beach, Community Park at the parking area in front of the Lions Playground at 9 A.M. or at the end of Shelly Road on the Oceanside of Highway 19a at about 9:10 A.M. The Sunday Bird Walk on June 26 will be going to Neck Point in Parksville. We will meet at the Birdstore at 9:00 A.M. or at the parking lot at Neck Point Park off Hammond Bay Road at about 9:20 A.M.
Swainson's Thrush: Ralph Hocken Photo. spotted a Chipping Sparrow carrying nesting material at the start of the walk. 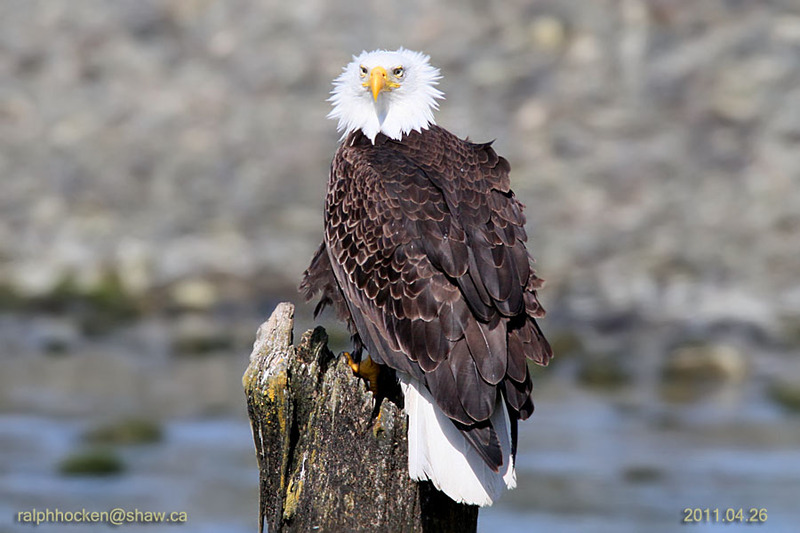 Bald Eagle: Ralph Hocken Photo. The Tuesday bird walk on June 07, 2011 will be going to Lot Ten in Qualicum Beach. We will meet at the Parksville Beach, Community Park aat the parking area in front of the Lions Playground at 9:00a.m. or at the end of Kinkade Road on the forest side of highway 19a at about 9:20 a.m. 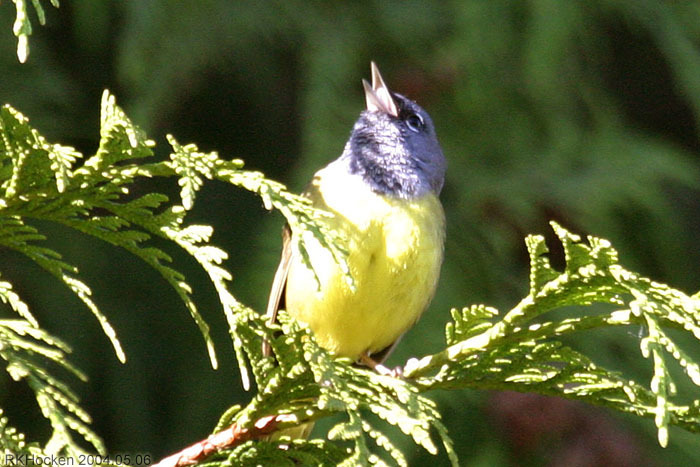 The Sunday Bird Walk on June 05, will be going to Springwood Park in Parksville. 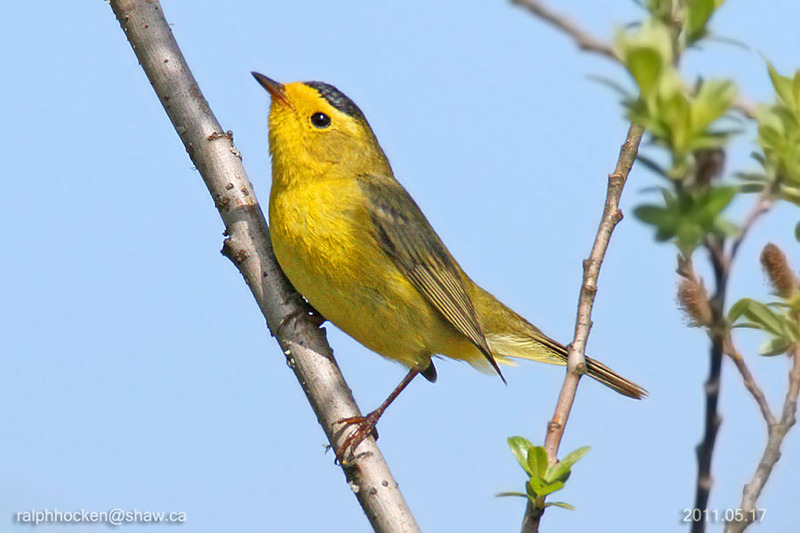 We will meet at the Birdstore at 9:00 A.M. or at the end of Despard Avenue off Highway 4a at about 9:30 A.M.